Henderson Fire Chief, Steven Goble extended an invitation for me to visit Firehouse 82 and the Firefighter Training Center at the same campus. I arrived at the Center to find a test fire extinguish in progress. Departments from all over Clark County use this facility to stay caught up on all of the new equipment and firefighting techniques. 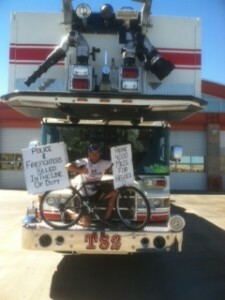 Scott “Nubs” Dakus, the Engineer at Firehouse 82, met with me and was great to talk with. He is an avid cyclist and gave me all kinds of pointers on riding long distance and many other nuances of cycling. Scott gave me a tour of the facility and talked me into being the hood ornament on the truck in today’s picture. The remainder of the day was spent heading south into Arizona. I took a small detour and drove The Kindness Bicycle across the Hoover Dam. I arrived in Kingman, Arizona late in the afternoon for a two day stay and a powerful ride tomorrow. This entry was posted on Wednesday, March 21st, 2012 at 3:46 pm	and is filed under Kindness. You can follow any responses to this entry through the RSS 2.0 feed. You can leave a response, or trackback from your own site.